Paris police deployed the device to help assure the security of participants in the UN climate change summit currently in session. Paris police launched an Israeli-made Skystar 180 aerostat surveillance balloon over the French capital to help assure the security of about 200 worldwide delegates to the 11-day United Nations Framework Convention on Climate Change (COP21) that began November 30 . 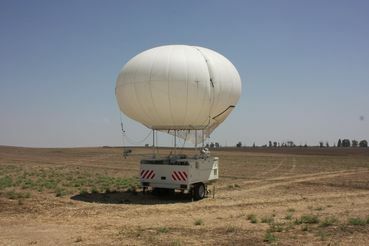 The Skystar 180 is one of several aerostat models designed and manufactured in Yavne by RT Systems for use in intelligence, surveillance, reconnaissance and communications. The small Skystar 180 tactical aerostat system provides mid-range surveillance defense and security from an altitude up to 1,000 feet (300 meters) above ground. “By providing an elevated platform, well above the field of operation, the system offers an indispensable, dominating view of the scene below,” the company explains. The system is based on a towable trailer and consists of a stabilized day/night electro-optical payload suspended from a helium-filled aerostat. In Paris, the balloon is using an electro-optical payload from Israeli defense company Controp, based in Hod Hasharon. The balloon is tethered to a portable ground control station where personnel process the transmitted surveillance video and data. israel always offers protection and help, and yet it's still considered ok to spew anti-isrrael rhetoric in all international forums. Knud, if you want to boycott Israel that is your choice. Please hand over your cell and computer as they are Israeli inventions and products. Bye & good riddance. Interesting way to deal with the escalating terrorism. Can we spell Big Brother actively scanning every move you make now?